BOSTON--(BUSINESS WIRE)--On the eve of International Women’s Day and the one-year anniversary of its SPDR®SSGA Gender Diversity Index ETF (ticker: SHE), State Street Global Advisors (SSGA), the asset management business of State Street Corporation (NYSE: STT) is calling on the more than 3,500 companies that SSGA invests on behalf of clients, representing more than $30 trillion in market capitalization1 to take intentional steps to increase the number of women on their corporate boards. 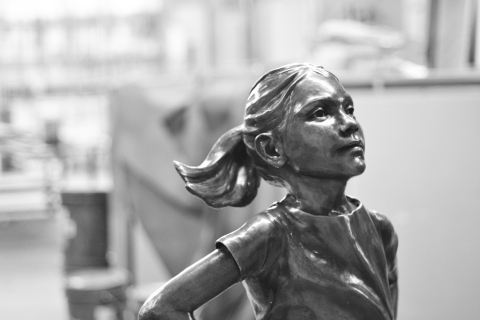 To mark this effort and the power of women in leadership, SSGA has placed a statue of a young girl, representing the future, in the center of the world’s financial capital – right near Wall Street in New York City. Despite this, although there has been some progress made on the inclusion of women on corporate boards, one out of every four Russell 3000 companies do not have even one woman on their board, and nearly 60 percent have fewer than 15 percent of their boards comprising women directors. SSGA today issues guidelines to drive greater board gender diversity through active dialogue and engagement with company and board leadership. In the event that a company fails to take action to increase the number of women on its board, SSGA will use proxy voting power to influence change - voting against the chair of the board’s nominating and/or governance committee if necessary. "I wholeheartedly support State Street's efforts," said Chris Ailman, Chief Investment Officer, CalSTRS. "Companies need to step up and better utilize the talents and leadership of women in their Corporate Boards, C-suite and throughout their ranks. 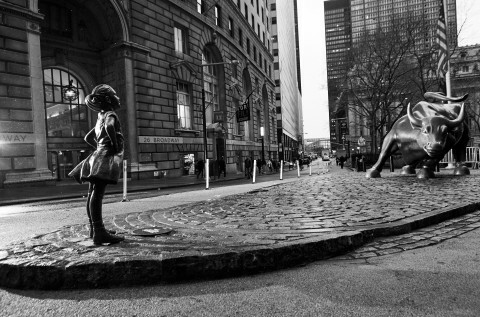 This statue boldly signals to financial markets that the future depends on investing in the power of women. We all need to lean in and be bold for change now." To help address the gender gap head-on, SHE incorporates an innovative charitable component that focuses on strengthening the next generation of women leaders - particularly in industries where women have low representation today such as STEM (Science, Technology, Engineering and Math). SSGA is directing a portion of their revenues and a match from SSGA to a Donor Advised Fund, which has awarded a $50,000 grant to Girls Who Invest, a nonprofit organization founded in April 2015 dedicated to increasing the number of women in portfolio management and executive leadership in the asset management industry. *Assets under management were $2.47 trillion as of December 31, 2016. AUM reflects approx. $30.62 billion (as of December 31, 2016) with respect to which State Street Global Markets, LLC (SSGM) serves as marketing agent; SSGM and State Street Global Advisors are affiliated. 2 The methodology used in MSCI’s study is different than that of the index, and as such, the results of the study should not be viewed as indicative of future performance of the index or SHE. Return on equity is not representative of the performance of any investment or the potential return of any ETF. 3 Source: Lee, Linda Eling, et al. Women on Boards: Global Trends in Gender Diversity on Corporate Boards, MSCI, November 2015. Accessed on February 17, 2016. MSCI defined strong female leadership as having a board of directors with at least three women, which research suggests comprises a critical mass for decision making influence, or a percentage of women that’s higher than average in the company’s country. MSCI defined companies without a critical mass of women at the top as companies with less than three women on their board of directors or a lower percentage of women than the average in the company’s country. Gender diversity risk the returns on a portfolio of securities that excludes companies that are not gender diverse may trail the returns on a portfolio of securities that includes companies that are not gender diverse. Concentrated investments in a particular sector or industry (technology sector and electronic media companies) tend to be more volatile than the overall market and increases risk that events negatively affecting such sectors or industries could reduce returns, potentially causing the value of the Fund’s shares to decrease. Passively managed funds hold a range of securities that, in the aggregate, approximates the full Index in terms of key risk factors and other characteristics. This may cause the fund to experience tracking errors relative to performance of the index. The whole or any part of this work may not be reproduced, copied or transmitted or any of its contents disclosed to third parties without State Street express written consent.